Boat type ----------------------- Powerboats Charter country ----------------------- Croatia Charter area ----------------------- Mediterranean Sea - Adriatic Sea - Dalmatia - Kornati Islands - Mediterranean Sea Port ----------------------- Please choose a country! Be the first guest at the brand new speedboat Jeanneau Cap Camarat 7.5 wa serie 2. Sail swimming with family or friends and explore the many beautiful bays of Central Dalmatian islands. Visit and sail around National Park Kornati and National Park Krka, which are located close to our port. Relax and enjoy the sun on sea. 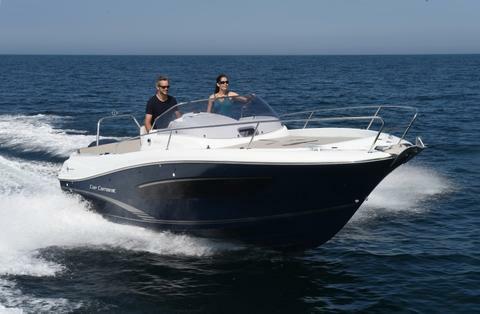 2 boats of Rent A Boat "charlie"
Your search: Company: Rent a boat "Charlie"
company: Rent a boat "Charlie"
Be our guest at the brand new speedboat Jeanneau Cap Camarat 7.5 wa serie 2. Sail swimming with family or friends and explore the many beautiful bays of Central Dalmatian islands. Visit and sail around National Park Kornati and National Park Krka.